The past summer break, a motley crew comprising students, alumni, and professors from the National University of Singapore set sail on a schooner named Four Friends, heading west from the large island of Borneo (from Pontianak) to remote islands in the South China Sea and further west to Bintan, which lies just south of our remote island, Singapore. After the eventful sea voyage, the crew now presents a visual exhibition and creative presentation based on the places visited and encounters with our distant neighbours. Join the crew as they bring you back out to sea and recap thier voyage through bite-sized presentations. Highlights of the expedition include encounters with the spirit world, marriage proposals that came their way, and conversations they had with locals at sea and on land about how we are more connected than we realise. Through the presentations, steered by sailors with a sailing resume of anywhere between 2 weeks to 70 years, they invite you to explore the possibilities of seafaring in navigating the world we live in. They will also be recreating the sensory experiences of being on board Four Friends. Learn how to cut and apply aloe vera the OG way, soap up with seawater, and find out what foods are suitable for life out at sea. Be warned… bring your pills for seasickness! 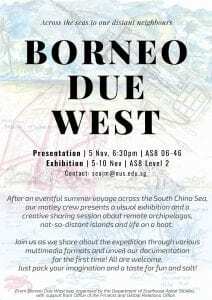 The presentation will also kick off a two-week long exhibition which will transform the vast expanse of AS8 Level 2 into a map of the part of the South China Sea they drifted through. Playing on the notion of scale, perspective, and distance, they invite all to navigate through a projection of their journey. You can engage with the map by viewing up close photos curated from the voyage through various archipelagos. Otherwise, you may also enjoy a bird’s eye view of the map two floors up from bridges at AS8 Level 3 or Level 4. A guided tour through the islands will be taking place at 8pm on 5th November 2018 at the end of our presentation. Allow the crewmates to welcome you on deck! ‘Borneo Due West’ is a sailing trip in June 2018 organised by the Department of Southeast Asian Studies at the National University of Singapore. 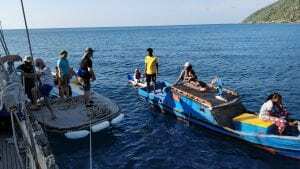 It was planned and lead by two scholars of Indonesian culture and society — Associate Professor Jan Mrázek together with Assistant Professor Miguel Escobar, and skippered by Captain Warren Blake who has thus far logged over 70 years of sailing. The voyage was also organised with support from the Provost Office and the Global Relations Office, NUS.